The Minnesota Vikings are wasting no time in taking steps to protect the terms coined for their crazy walk-off win in the divisional round of the NFL playoffs last Sunday. 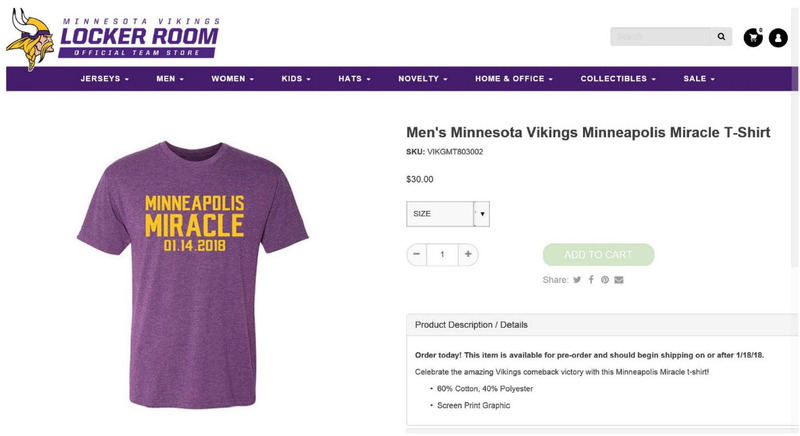 On January 15th, the day after the miraculous win, Minnesota Vikings Football, LLC filed four federal trademark applications with the U.S. Patent and Trademark Office - one for MINNESOTA MIRACLE and three for MINNEAPOLIS MIRACLE. The applications cover a variety of goods and services. The application for MINNESOTA MIRACLE covers a broad range of goods and services spanning across ten different classes, including football helmets, jewelry, cups/mugs, toys and sporting goods, television broadcasting services, education and entertainment services in the nature of professional football games and exhibitions, arena services, and more. 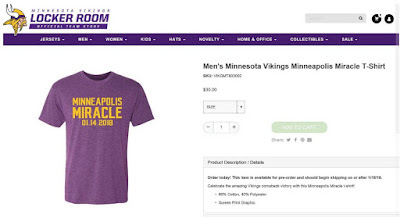 One of the MINNEAPOLIS MIRACLE covers identical goods and services. The Vikings filed both these applications on an intent to use basis, suggesting they are not currently using the mark in conjunction with all these goods and services but have a bona fide intention to do so in the near future. 15 USC 1051(b); TMEP 806.01(b). Interestingly, despite filing these applications within a day of the Vikings' win, the Vikings filed the other two MINNEAPOLIS MIRACLE applications on a 1(a) basis, indicating they were already selling/transporting the listed goods and advertising and rendering the listed services in interstate commerce before filing the applications. One of those applications covers t-shirts and various entertainment services related to professional football games while the other covers various broadcasting services. In any event, the Vikings didn't waste any time in seeking to enhance their legal rights related to these terms. According to the electronic time stamps, these four applications were filed between 3pm and 11:30pm on January 15th. The team must have gotten on the phone with their legal counsel pretty quickly after the win to get these filed. According to my quick search, these are the first trademark applications for MINNESOTA MIRACLE or MINNEAPOLIS MIRACLE filed by the Vikings, although the team is currently listed as the owner of 118 other filings with the USPTO (the vast majority of which are pending applications that have not registered yet).